I wish I could tell you that this is a scene from my garden. Alas, beautiful Bougainvillea doesn't grow like that here in New England. But perhaps you live in a warmer climate and you're lucky enough to grow these. The bracts are the colorful part of a bougainvillea rather than the inconspicuous white flower. This scene was inspired by the garden of some friends who live in south Texas. 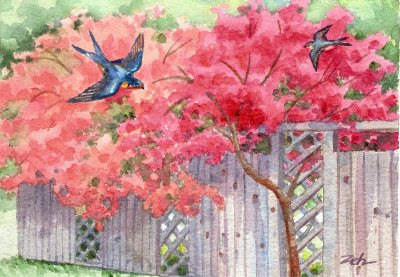 They are always telling me about the swallows that fly about their place and I thought it would be just right to add a couple of swallows to this painting.